The Project Consultant - your contact through job completion - meets with you to discuss your needs and schedule, and present the McClurg Team qualifications. We'll answer your questions and strive to thoroughly understand your requirements. After meeting with one of our estimators, the Project Consultant develops a preliminary budget range for your project and discusses it with you to ensure we're meeting your expectations. The Project Consultant presents our preliminary project specifications and estimate to you. We may also present alternatives for meeting your requirements and adding value to your home. Next, you'll receive a written description of your project. Once you approve, we'll request a 5% retainer and schedule your project. Your Project Consultant will present the final design and assist you in making product selections. The Project Consultant presents to you a detailed contract, along with any pertinent drawings or attachments. 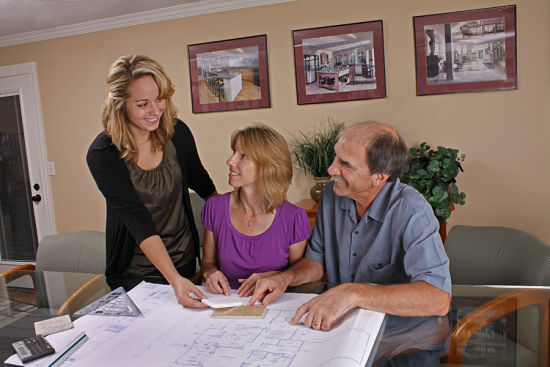 Once you approve the contract, a McClurg Production Team is assigned to your project. You meet with the Project Consultant and the Lead Carpenter (or Project Manager), who is in charge of construction. The Project Contract is read through and drawings and site requirements are discussed. You'll also receive a "Blue Book" with important phone numbers, guides for corresponding with us, and a project schedule. The Lead Carpenter is your day-to-day contact during construction. The Project Consultant will meet with you weekly to review progress, answer design questions and, if necessary, prepare change orders. Your dream is reality! The Lead Carpenter and Project Consultant walk you through the finished project and ensure your complete satisfaction. As industry leaders, we're very focused on customer satisfaction. When your project is finished you'll be asked to respond to an independent construction quality survey. It'll only take a few minutes and it's a great way to help ensure your satisfaction both on your current project and future ones.